Bachelor of Science, Organic Chemistry, Hue University (Vietnam) (Sep. 1983 - Jul. 1987). T. N. Q. Anh, H. Harada, S. Fujii, P. N. Anh, P. K. Lieu and S. Tanaka (2016). Preliminary analysis of phosphorus flow in Hue Citadel. Water Science & Technology, 73 (1), 69-77. Y. Nagano, T. Teraguchi, P. K. Lieu, and H. Furumai (2014). Characterization of water pollution in drainage networks using continuous monitoring data in the Citadel area of Hue City, Vietnam. Water Science & Technology, 70 (4), 612-619. Pham Khac Lieu, Dang Thi Thanh Loc, Le Trong Nghia (2015). Greenhouse gas emissions from septic tank and septage treatment in Hue city. Journal of Science and Technology (Vietnam Academy of Science and Technology), 53 (3A), 301-306. Nguyen Ngoc Truc Ngan, Le Van Tuan, Pham Khac Lieu, Duong Van Hieu, Hoang Thi Nhu Y, Le Thi Hoai Thuong, Shigeo Fujii, Truong Quy Tung (2015). Hydrogen peroxide as an extra oxygen source for activated sludge. Journal of Science and Technology (Vietnam Academy of Science and Technology), 53 (3A), 97-102. Tran Nguyen Quynh Anh, Hidenori Harada, Shigeo Fujii, Pham Nguyet Anh, Pham Khac Lieu, Shuhei Tanaka (2015). Characterization of combined sewer discharge in Hue city, Vietnam. Journal of Science and Technology (Vietnam Academy of Science and Technology), 53 (3A), 187-192. Truong Quy Tung, Pham Khac Lieu, Hoang Thi My Hang, Le Van Tuan (2015). Estimation of nitrogen and phosphorus loads from main wastewater sources in Hue city. Journal of Science and Technology (Vietnam Academy of Science and Technology), 53 (3A), 133-138. Nguyen Thi Ngoc Thanh, Pham Khac Lieu (2015). Wastewater treatment in the hybrid biological reactor: efffect of hydraulic retention time and oxygen supply on total nitrogen removal and nitrification. Journal of Fisheries Science and Technology (Nha Trang University), Special issue, 93-99. Pham Khac Lieu, Hoang Thi My Hang, Ton That Huu Dat (2013). Performance of H2O2-assisted submerged aerated biofilter for landfill leachate treatment. Journal of Science and Technology (Vietnam Academy of Science and Technology), 51 (3B), 28-34. Pham Khac Lieu, Hoang Thi My Hang, Trinh Thi Giao Chi (2012). Development of a submerged aerated fixed bed reactor using wool as biomass carrier and application for the treatment of landfill leachate. Hue University/////'/////s Journal of Science, 73 (4), 167-174 (in Vietnamese) . Pham Khac Lieu, Dang Thi Thanh Loc, Huynh Thi Mau Thin (2012). Urban environmental sanitation in Hue Citadel: existing status and sollutions for the improvement. Hue University/////'/////s Journal of Science, 73 (4), 175-186 (in Vietnamese). Lieu Pham Khac and Chung Duong Thanh (2011). Lab-scale application of combined partial nitritation-anammox process for nitrogen removal from landfill leachate. University of Danang’s Journal of Science and Technology, 45 (4), 99-106. Phạm Khắc Liệu, Trần Anh Tuấn, Nguyễn Bắc Giang (2011).Current status of public water access and use in rural area of Thua Thien Hue province: the case studies of Dien Loc, Quang Ngan and Quang Tho communes. Hue University////'////s Journal of Science, 69 (6), 65 - 74 . Ho Ngoc Anh Tuan, Trinh Thi Giao Chi, Pham Khac Lieu (2010). Assessment of impact of railway noise on community health and daily activities in Hue city. Hue University////'////s Journal of Science, 59 (25), 131-139 (in Vietnamese) . Phan Thi Hong Ngan, Huynh Thi Phuc, Pham Khac Lieu (2010). Acclimation of activated sludge to saline culture medium towards treatment of aquacultural wastewater. Hue University///////'///////s Journal of Science, 24 (58), 97-106 (in Vietnamese) . N.T.P. Nam, P.K. Lieu and T.T.G. Chi (2008). Study on slaughterhouse wastewater treatment with an aerobic attached - growth process using acryl-fiber biomass carriers. Hue University’s Journal of Sciences, 48 (14), 125-134 (in Vietnamese) . K. Furukawa, P.K. Lieu, H. Tokitoh and T. Fujii (2006). Development of single-stage nitrogen removal using anammox and partial nitritation (SNAP) and its treatment performances. Water Science & Technology, 53 (6), 83–90 . Pham Khac Lieu, Hayato Homan, Atsuhiro Kurogi, Yasunori Kawagoshi, Takao Fujii, and Kenji Furukawa (2006). Characterization of sludge from single-stage nitrogen removal using anammox and partial nitritation (SNAP) process. Japanese Journal of Water Treatment Biology, 42 (2), 53-64 . Pham Khac Lieu, Ritsuko Hatozaki, Hayato Homan, and Kenji Furukawa (2005). Single-stage nitrogen removal using Anammox and partial nitritation (SNAP) for the treatment of synthetic landfill leachate. Japanese Journal of Water Treatment Biology, 41 (2), 103-112 . Pham Khac Lieu, Tran Hien Hoa, Luong Ngoc Khanh, Tran Hieu Nhue, Kenji Furukawa (2005). Anaerobic ammonium oxidation for nitrogen removal from wastewater and its perspective of application in Vietnam. Review Construction No.452, 41-45 (in Vietnamese). Nguyen Van Hop, Hoang Thai Long, Pham Khac Lieu (1999) Assessment of waste loads discharged into lakes in Hue citadel and their nutrient removal capacity. Bulletin of Scientific Research, Hue University of Sciences, 11 (1)(in Vietnamese). Do Thi Thu Trang, Yasuhiro Matsui, Nguyen Phuc Thanh, Pham Khac Lieu, Tran Ngoc Tuan. Commercial and institutional solid waste generation and relevant factors: Case study in tourism city - Hue, Vietnam,In Proceedings of the 10th Expert Meeting on Solid Waste Management in Asia and Pacific Islands (SWAPI), Tottori, Japan, February, 2012 , 2012 , pp.43-50. Le Cong Nhat Phuong, Nguyen Huynh Tan Long, Pham Khac Lieu, Takao Fujii and Kenji Furukawa. Enrichment of anammox biomass and its application in the treatment of swine wastewater in the South Vietnam. Proceedings of the First International Anammox Symposium (IANAS 2011), May 19-21, 2011, Kumamoto, Japan, pp.127-134. P.K. Lieu, T.T.G. Chi and K. Furukawa. Treatment of coagulated slaughterhouse wastewater using a novel submerged aerated fixed bed (safb) reactor. Proceedings of the 8th General Seminar of the Core University Program, organized by Osaka University and Hanoi National University, Osaka, Japan, November, 2008, pp.295-302. Le Cong Nhat Phuong, Nguyen Phong Phu, Ngo Ke Suong, Nguyen Tien Thang, Pham Khac Lieu and Kenji Furukawa. Nitritation-Anammox pilot system for nitrogen removal from effluent of UASB reactor treating swine wastewater. Proceedings of the 7th General Seminar of the Core University Program; organized by Osaka University, Hanoi National University and Danang University; Danang, Viet Nam, September, 2007; pp.313-319. Kenji Furukawa, Hayato Homan, Yuichiro Kashihara and Pham Khac Lieu. Studies on nitrogen removal performances for Single stage nitrogen removal using anammox and partial nitritation (SNAP) process. Proceedings of the 7th General Seminar of the Core University Program, organized by Osaka University Hanoi National University and Danang University; Danang, Viet Nam, September, 2007; pp.387-394. Furukawa, K., Lieu, P.K., Hatozaki, R., Homan, H., and Fujii T. Single-stage nitrogen removal using anammox and partial nitritation (SNAP) process and its application to treatment of synthetic landfill leachate. Proceedings of the 10th International Waste Management and Landfill Symposium (SARDINIA 2005), Sardinia (Italy), October 2005 (CD-ROM, No.183). Furukawa, K., Lieu, P. K., Tokitoh, H. and Fujii, T. Development of single-stage nitrogen removal using anammox and partial nitritation (SNAP) and its treatment performances. Proceedings of the 2005 IWA-ASPIRE Regional Conference and Exhibition (1st IWA-ASPIRE), Singapore, July 2005 (CD-ROM, No.6E-3). Furukawa, K., Lieu, P. K., Tokitoh, H. and Fujii, T. Single-stage nitrogen removal using anammox and partial nitritation (SNAP). Proceedings of the IWA International Conference 2005 (FWWS-XIAN 2005), Xi’an (China), May 2005, pp.1039-1047. Pham Khac Lieu, Hiroyuki Tokitoh, Kenji Furukawa. Partial nitritation of landfill leachate using acryl resin fiber as an attaching material. Proceedings of the Third Asian-Pacific Landfill Symposium 2004 (APLAS 2004), Kitakyushu (Japan), October 2004, pp.483-489. Kenji Furukawa, Hiroyuki Tokitoh, Pham Khac Lieu, and Takao Fuji. Single-stage nitrogen removal using Anammox and partial nitritation. Proceedings of the Sino-Japanese Forum on Protection and Restoration of Water Environment. Beijing (China) 2004, pp.179-186. Pham Khac Lieu, Hiroyuki Tokitoh, and Kenji Furukawa. Partial nitritation of synthetic landfill leachate in an attached immobilized reactor with acryl fiber biomass carrier. Proceedings of the 2nd Seminar on Environmental Science and Technology Issues related to the Urban and Coastal Zones Development. Ha Long (Vietnam), September 2004, pp.192-199. Heinz Eckhardt and Pham Khac Lieu. River water quality management using water quality indices and tools from EIA: a case study from Vietnam. Proceedings of International Conference on Large Scale Water Resources Management in developing countries, Kathmandu, Nepal, 10/1997. Pham Khac Lieu, Heinz Eckhardt. Determination of deoxygenation and reaeration rate constants of the Huong River in Hue city. Proceedings of National Conferene on Chemistry, Hanoi, Vietnam, October, 1998 (in Vietnamese). Wastewater management in shrimp culture on sandy land: an emerging environmental issue in coastal region of Central Vietnam. Workshop on Toward to Construction of Sustainable Water Environment in South East Asia. Kumamoto University, Japan, Feb. 28, 2012. A survey on informal sectors handling recyclable wastes in Hue city, Vietnam. Debrief Meeting of the Practical Research and Education of Solid Waste Management Based on Partnership between Universities and Governments in Asia and Pacific Countries. Okayama University, Japan. February 4-5, 2012. Current status of water-related sanitation conditions in Hue city, Vietnam. International Conference on Sustainability Science in Asia (ICSS 2012). Bali, Indonesia, January 11-13, 2012. Anammox - a novel process for nitrogen removal from wastewater eliminating the CO2 emission. Workshop on "Environment Problems: Vulnerability and Adaptation to Climate Change". Organized by Asia-Africa Environment Leader Program, Shizuoka University and Thua Thien Hue Department of Science and Technology, Hue, December 13th, 2010. Introduction to urban sanitation status in Hue city, Vietnam. SWITCH Workshop on "Strategic planning for Integrated Urban Wastewater Management". Organized by UNESCO-IHE and Hanoi Water Resource University, Hanoi, 26-27 October, 2010. Current status of physical and wastewater-receiving characteristics of lakes and canal inside Hue Citadel. International workshop on "Wateralong Community: Hue". Organized by The University of Tokyo and Hue University, Hue, August 16th, 2010. Waste Recycling and Resource Recovery in Hue City at a Glance. Project kick-off meeting "Practical Research and Education of Solid Waste Management Based on the Partnerships among Universities and Governments in Asia and Pacific Countries”, Organized by Solid waste Management Research Center, Okayama University, Japan, July 23rd, 2010. Basic fatcs about urban sanitation in Hue city, Vietnam. Project workshop "Sanitation Constraints Classification and Strategy Development in Asian Cities (SaniCon-Asia), Organized by GSGES, Kyoto University, Japan, July 20th, 2010. Water quality concerns of lakes and canals in Hue Citadel. Vietnam-Japan Workshop "Wateralong community: Hue", Organized by GCOE for Sustainable Urban Regeneration, University of Tokyo, Japan, January 11th, 2010. 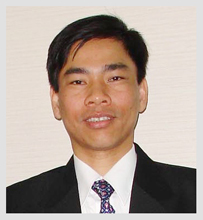 Pham Khac Lieu (Team leader) et. al. Assessment of historical development and present water quality of the Tam Giang-Cau Hai lagoon in Thuathien Hue. Consulting Report Vietnam-Netherland Coastal Zone Mangement Pilot Project in Thuathien Hue province. 10/2001 (in Vietnamese). Le Van Thang, Le Van Tan,..., Pham Khac Lieu, et al. Study on scientific foundations in order to formulate strategies for environmental protection in North Central Part provinces (Vietnam) to the year 2010. Project report. Ministry of Science, Technology and Environment. 3/2000 (in Vietnamese). Nguyen Van Hop, Hoang Thai Long, Pham Khac Lieu, et al.. Assessment of environmental status and waste removal capacity of Tinh Tam Lake inside Hue citadel. Pilot project, commissioned by Thua Thien Hue province and Nord Pas de Calais region ( France), 2000. Nguyen Van Hop, Hoang Thai Long, Pham Khac Lieu, et al.. Water quality assessment of Tam Giang-Cau Hai and Lang Co lagoon systems in Thua Thien Hue. Midterm report of Project on Sustainable Development of Thua Thien Hue lagoon systems. Hue, 3/1999.